The British defensively armed merchant ship Culebra was built as the War Mirage in 1919 by Irvine’s Shipbuilding and Drydock Company, Limited in West Hartlepool, Sunderland, England. A single-engine steam ship of the World War I-vintage C-class design, her 3 cylinder engine was made by Richardson Westgarth, also of Hartlepool. It produced 310 nominal horsepower and propelled the ship at 10.5 knots. Culebra’s official number was 140660 and she was the 603rd hull built by Irvine’s. The ship was 3,044 gross registered tons. Her dimensions were 342 feet long, 46’10” wide, and 21’8” deep. Her Call Sign was G.C.N.K. Originally built for the British TSC (The Shipping Controller) in London, in the same year of her build she was sold to John Glynn & Sons Limited, of Liverpool and renamed S.S. Riposto. In 1923 she was again sold, this time to the Royal Mail Steam Packet Company, which had been operated a mail service between the UK, the Caribbean and North and South America since 1839. In 1927 the Royal Mail Line, as it was known, of Royal Mail House, Leadenhall Street, London purchased the White Star Line. In 1932 the company changed its name to the Royal Mail Line (later still, in 1965 the firm was purchased by Furness, Withy & Company). Culebra’s contact person at Royal Mail Line in 1940 was Captain Francis G. Spriddell, CBE, Marine Superintendent. The Culebra, without the mine-clearance contraption on her bows, probably before the outbreak of World War II in 1939, after which she would have been painted wartime gray. As Head wrote, “The Culebra was a veteran of several Atlantic convoys.” Indeed she sailed in the very first ON convoy, ON 001, which left Liverpool 26 July 1942 and dispersed 9 August, after which she steamed independently for Bermuda. On her final voyage Culebra joined 37 other merchant ships and 11 escorts including USS Cole in Convoy ON 53, which departed her home port of Liverpool the day after New Year’s Day in 1942. 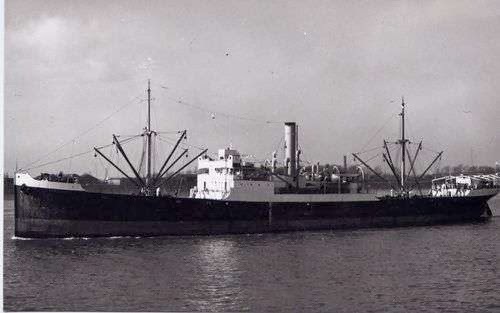 According to www.warsailors.com the convoy originated in Milford Haven on the 1stoff January, 1942, so it is probably that the Culebra joined the group as it sailed north. According to www.convoyweb.co.ukthe Convoy Commodore was Captain C. G, Illingwroth aboard the Empire Robin. Two other ships in the same convoy were to be sunk in the Bermuda area: the Empire Wildebeeste by U-106/Rasch on the 24thof January with nine killed, and the Ramapo on 16 February by U-108/Scholtz, with the loss of all 38 men. Others sunk from the same convoy were the Maro on 20 January, the Vassilios A. Polemis two days later and the Icarion on the 27thof January. It was a deadly time to approach the American seaboard so soon after Hitler declared war on the United States in mid-December 1941, subsequently unleashing his U-boats on the coast. The Culebra’s Master was no longer Jones but now Captain George Douglas Bonner, aged 46. All 45 men on board were British nationals, though Assistant Cook Gerard Galea, 30, was originally from Valetta, Malta. The youngest crew member was Gilbert Frederick Warner, Steward’s Boy, who was just 17. His parents, Frederick and Amy, lived in Saint Alban’s, Hertfordshire. Amongst other in the young crew Roy Haigh was 18, Leslie Thomas Gutteridge 19, and the following were in their twenties: John Henry Brook, Desmond Neulison Ebanks, Adrien Fenton, Alison Wellington Groves, Antony Frederick Hays, O’Leary Linwood Hennings, Ernest Henry Jenkins, John Francis Rooney, Albert Edison Scott, and John Tough. Edward Joseph Boon was a gunner with the 5/3 Maritime Regiment of the Royal Artillery.The names of the four Naval Gunners were Thomas V. Buddell, John F. Cornell, Robert P. Farley (all Able Seamen) and Corporal Graham Johnston. Chief Officer Harold Cornick was 31. On her final passage the Culebra was loaded with “stores” and “general cargo” which included mail and aircraft in crates and in parts on deck. She was to stay in the convoy for over two weeks, until Monday the 19th of January, whereupon the ship was to head independently to Bermuda and from thence to Jamaica on her regular run. By Sunday January 25th the Culebra had reached a point in the North Atlantic which was 679 nautical miles south of Newfoundland, 2,500 miles from London, 600 miles northeast of Bermuda and 1,000 miles east-southeast of New York. 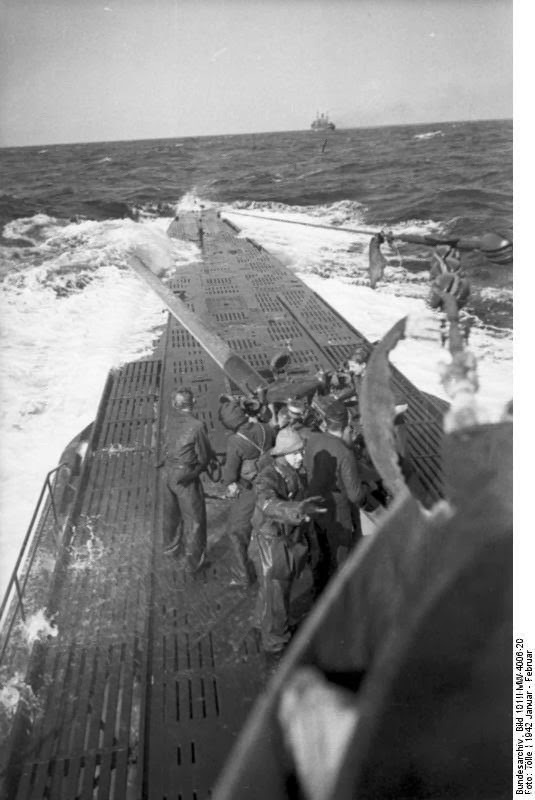 It was in that vulnerable position that then-Kapitänleutnant Reinhard Hardegen aboard the highly successful German U-Boat U-123 came across the lone ship on the wide sea. U-123 was returning from his celebrated opening attacks of Operation Drumbeat off New York and Cape Hatteras, decided to swing south and perform an exploratory sail-past of Bermuda on his way home. He entered the region from the west-northwest on the 20th, and skimmed very close to Bermuda on the 22nd before exiting the area to the east-northeast on the 24th. It is one of half a dozen patrols to come so close to the island that the commander undoubtedly utilized the lighthouses of Bermuda as a navigational “fix”. Hardegen had just sunk sevem ships (Cyclops, Nornesss, Coimbra, Nordana, City of Atlanta, Malay, Ciltivaira, and was on his way to sink the Pan Norway) to total 57,627-tons, including one damaged, since 12 January. His was the first U-boat of World War II to attack the US coast – in World War I not only had U-boats done so, but one of them, U-53, spent the afternoon of October 7, 1916 hosting officers of the (neutral) US Navy in Newport before sinking six Allied ships off Nantucket. 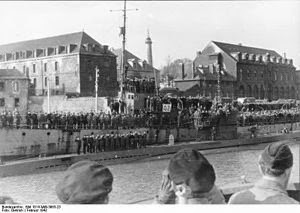 U-123 began its patrol on the 23rd of December, 1941 in Lorient, and ended it in the same port on the 9th of February 1942. On the 19th of January the submarine was chased by a Norwegian whaling factory ship, the Kosmos II. 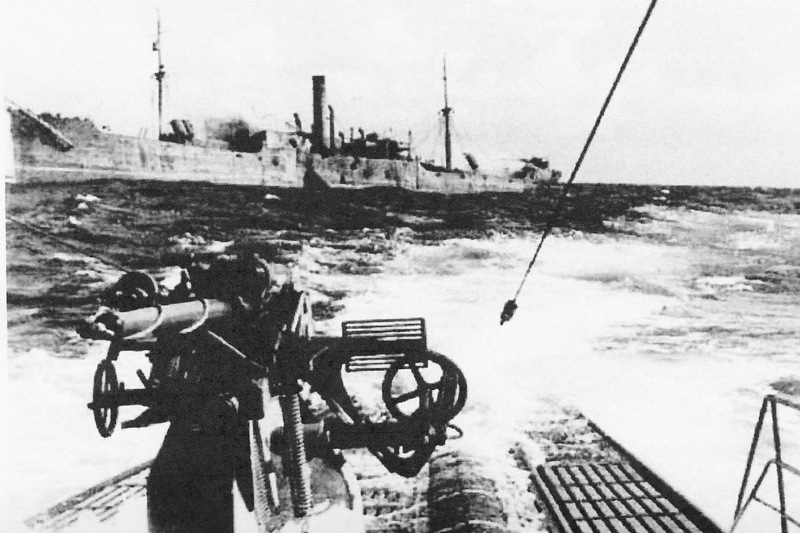 It was a close call but U-123 was able to outrun its erstwhile quarry before aircraft called in by the Norwegians could arrive and cause permanent damage. 40° to starboard a steamer in sight. Our Sunday roast. His course 220°, speed 9 knots. Overtaken, let him have it! about 600 meters behind him. Deck gun ready and opened fire. The first shots hit the stern, then one each under the bridge and in the engine room. Steamer mans the gun and fires. The firing pin of our MG C30 is broken, so we fired with the deck gun at his gun. Several hits underneath, but he continues to fire until a direct hit struck the pivot. Gun crew out of action, the barrel can’t be moved anymore. 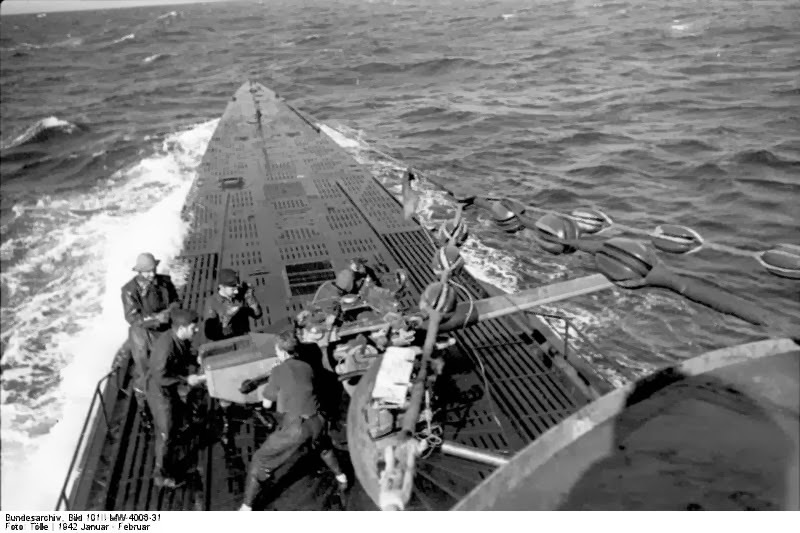 This photo clearly shows the mine-clearing contraption on the bow of the Culebra, identifying it. We received 5 hits, which did not penetrate the pressure hull. Because they hit very low, I assume that they fell short, burst on the surface and only the splinters hit our hull. 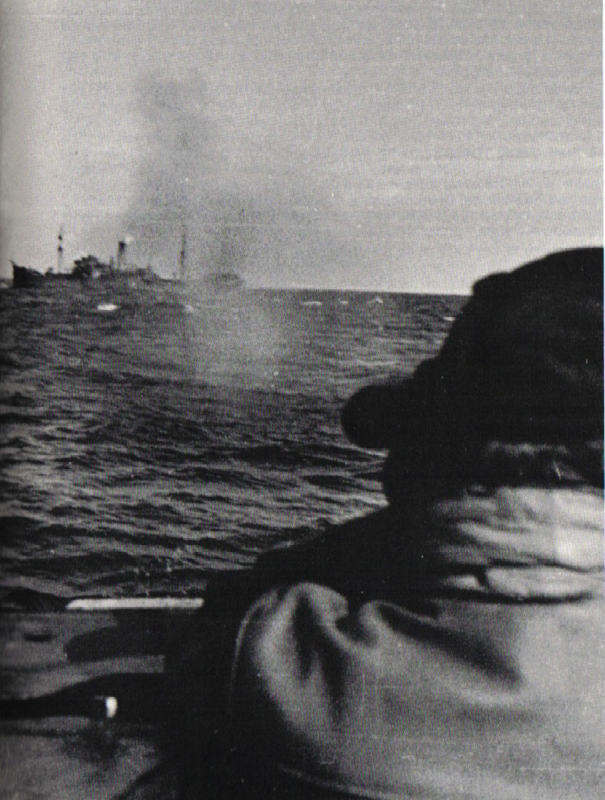 Some shots passed between conning tower and deck gun, one could hear them whistling past. Ship is releasing steam, bridge is burning and the crew is abandoning ship in the lifeboats. Strangely they did not release the two big rafts that are intact on great slipways over the foremost and rearmost hatches. Perhaps because they were on the side we fired on. Replaced the firing pin of the 20 mm AA gun. We fire a single shot into the scenery to test the weapon. This shot exploded in the barrel, apparently due to a defect in manufacture of the round. Premature detonation. Special leader Art. Mt. Toelle is unfortunately hit by shrapnel on the back of his head and fell to the deck bleeding badly. Mtr. OGfr. Vonderschen has a 5 cm flesh wound on the left thigh, which is harmless. Not the fault of anyone. Vonderschen belonged to the AA gun crew, Toelle was standing near the aft periscope taking photos of the burning steamer. We were firing to right aft. Toelle lost very much blood and had to vomit several times. The steamer was only able to send “SSS” without name and position [no shore stations report receiving the SSS – it does not enter the US enemy action report]. We approach the lifeboats and the first officer told us that the ship was CULEBRA (3044 GRT) from Liverpool loaded with “general cargo”. There is water in the boats and the survivors only have one bucket with shrapnel holes in it. We provide them with several buckets and provisions for a few days consisting of bread, lard and sausages and additionally a knife to open the canned food. They have enough water. 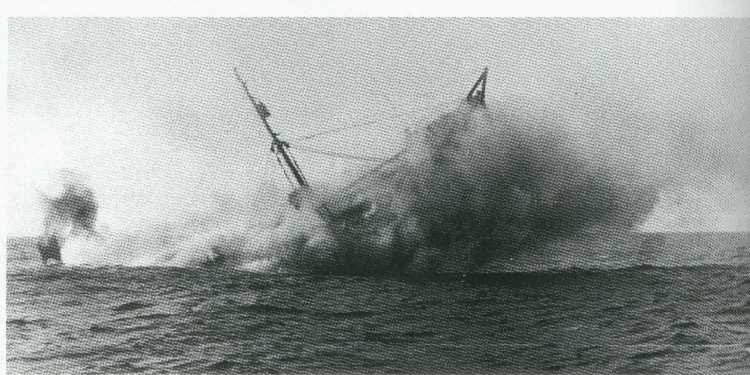 “U-123 shells and sinks a British Freighter (SS Culebra)”. The unusual mine-clearing contraption on the bow of the Culebra which Hardegen referenced is clearly visible, identifying this victim as the Culebra in its death-throes. The funnel can be seen on the lower left being submerged, and the forward mast is clearly visible. Gave them the exact position and the course to the Bermudas. The [text illegible] were swimming in the water and will be picked up by the boats. On the CULEBRA the signal munitions on the bridge and the ready ammunition for the gun now detonates. Funny looking fireworks with parachute rockets. Bridge collapses. We are shooting holes into the waterline aft. As the stern settles, the deck cargo shifts and we detect aircraft. Wings with a blue-white-red cockade and yellow ring around it, fuselages and tail assemblies. An inflated tire of a landing gear floats on the water. And the gentlemen call this “general cargo”!! On the 30th of January the British Admiralty sent out a forlorn query to “Foreign Stations: America and West Indies: CULEBRA due Bermuda 25/1 has not arrived.” It would be the ship’s epitaph and the last official correspondence in the war diaries of the US and UK, another small steamer lost in the larger predations of a global conflagaration. On the 27th of January Hardegen vectored in the Greek ship Mount Etna to retrieve survivors of the Pan Norway which he had sunk two days previously. Since Hardegen’s incursion off Bermuda occurred on 22 January 1942, just over one and a half months following the Japanese attacks on Pearl Harbor and the US entry into the war, this makes Hardegen’s brush with the greater Bahamas region the first such patrol there. It also renders any “SSS” or “submarine sighted” Morse code signals from Allied vessels or shore stations in the region before that date without credibility, since we know that no subs entered the area until end-January 1942. Hardegen, who is still alive in mid 2014, achieved the rank of Korvettenkapitän, though at the time he was Kapitänleutnant. Over his career he sank 21 ships for a total of 112,447 GRT and damaged four others for 32,516 GRT – he also sank one warship and damaged another. On 23 April 1942, following this patrol he was awarded the Knights Cross with Oak Leaves, and later the U-boat badge with Diamonds. A member of the crew of 1933 at the Naval Academy (Marineschule) in Mürwik, eastern Germany, he was only 30 at the time. U-123 returning to its base in Lorient, France on 9 February, 1942 some two weeks after sinking the Culebra. Note the enthusiastic crowds lining the wharves, U-Boats, and ships to welcome them. The patrol had lasted 49 days and pried open the highly target-rich hunting grounds off the American coasts. 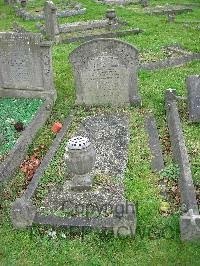 Photo of Harold Cornick gravesite in Kingston-Upon-Thames, Surrey, outside London. It is sadly but my the circumstances of the Culebra’s loss, empty.